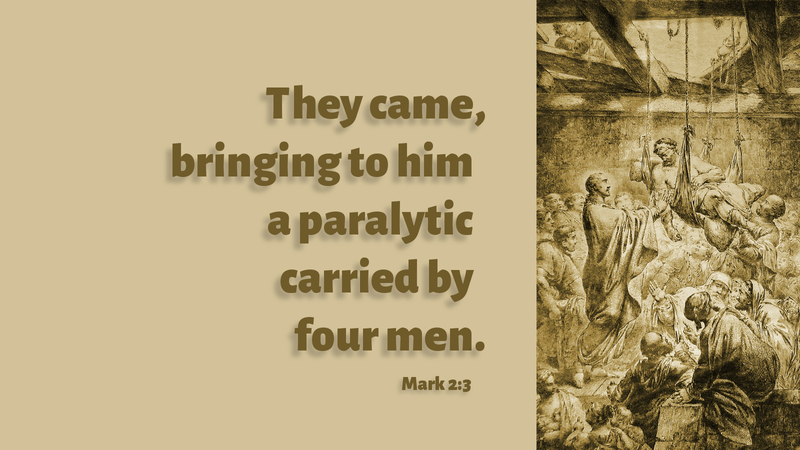 While there is much to catch our eye in the account of the healing of the paralytic, one of the most striking aspects is the obvious love and care of the four men who came to Jesus carrying the paralytic on a pallet. When they couldn’t get to Jesus through the door because of the great crowd, they removed part of the thatched roof to let the pallet down to Jesus from above. And Jesus notices the faith of the four men. Interesting, isn’t it, that Jesus sees the faith of the four friends, and that Mark makes a point to tell us that. It raises a couple of questions, I think. First, are we friends such that we carry our loved ones and neighbors to Jesus in prayer? And second, do we have friends who uplift and carry us when we are in need? Unfortunately, some of us are convinced we can do it all ourselves, we need no one else, we can get by on our own. I imagine we all know someone like that—or perhaps that’s us! Are we trudging through life isolated and alone, without close friends to support us when we are struggling, ill, or in need? As the Divine Godhead is a community of three persons, we are reminded that we, too, are to live in community. We each need two or three, maybe four friends (as with the paralytic!) who will carry us to Jesus in prayer, uplifting and encouraging us in life. While we tend to think of Lenten observance as an individual, personal journey, it is also a time to seek out other Christians for mutual conversation and support. Maybe it’s at Sunday worship, Sunday adult class or Wednesday Lenten soup suppers. Maybe it’s meeting with co-workers or friends for coffee once a week. Whatever shape it may take, we need others and others need us—as friends and companions along the way. Prayer: Almighty God, give to us friends such as the paralytic had—and let us be friends to others who need support and encouragement; through Jesus Christ our Lord. Amen.